You'll get up to six hours of battery life depending on the game. Nvidia announced that it was developing hardware for Nintendo Switch back in October, and at last night's presentation Nintendo released more details concerning the tablet's screen and storage. The Switch sports a 6.2-inch screen that outputs at 1280x720, or 720p. It runs on a custom Nvidia Tegra system-on-a-chip for its processor, and offers 32 GB of storage out of the box—well within the range of dedicated tablets such as Apple's iPad. Some of that internal storage goes toward the OS and various system resources. 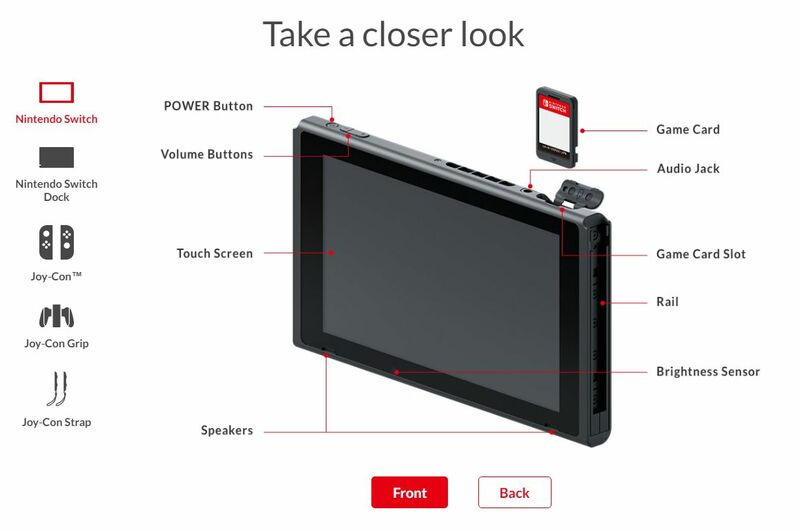 A diagram released by Nintendo provides more technical details. Storage can be expanded via a microSDXC card. "Game cards" drop into a slot at the top of the Switch, and battery life lasts up to six hours depending on the game being played. Legend of Zelda: Breath of the Wild, for example, is a high-end title; according to Nintendo, you can expect to wring roughly three hours of juice from the battery while playing on the go. Nintendo Switch launches on March 3 for $299.99. What's the resolution when connected to a TV? So is there wii/wii backwards compatibility through eshop purchases? No word on that afaik, but imo if they were smart they'd start offering that and 3DS games. Then again we're talking about the same people who are introducing a monthly free game on their online service. that is literally only available for a month. I got my kid a 2ds for Christmas, and stumbled on eshop titles that are only for the NEW 3ds? It's so needlessly confusing. Yeah, I think the only upside is that there were something like less than 10 titles that required a new 3ds. All SNES VC games require it but as far as new games go the only ones I know of that actually require it (although there are a few that run like crap on the old 3DS, they still technically work) were the Xenoblade Chronicles port and something else I'm forgetting. Ah yeah you're right a ton of VC titles require it. Not too much of a big deal imo since there are plenty of other alternatives to play VC titles. Why is Nintendo so dumb about hard drives? My 3 year old phone has double the space. Internal storage is only for saves and the OS, the games themselves are on carts. If you download a game, you need to put an external card in and download to that*. I believe the 3DS lets you store as many digital games on SD cards as will fit. Indeed it does. The real question is will Nintendo sticking with the stupid "block" format again? Just tell me how many gigs I have left on this thing! Ah. Didn't know that. That's a good sign of what we'll be able to do with Switch then. Your 3 year old phone also cost twice as much and required an overly expensive service plan. You probably didn't even bat an eye. The internal storage doesn't need to be any bigger. You'll store downloads on SD cards which you can buy anywhere for cheaper prices. What logic is there to offer a 64gb model or multiple SKUs when you have SD taking care of all that for far cheaper. Downloads stored on the cards? Odd. Yeah, they've done that for the last couple of them. They don't want to be in the business of selling you storage. So it's like the 3ds where you can just go buy a little storage card and put it in there? That's pretty cool. Yup, you put it in right under where the kick-stand comes out. it's great that i can pick up a huge sd card for cheap though. This was my grudge with the Wii U. 32GB is nothing these days... Why waste your time with it. 128 or even 256GB could have easily been the minimum. what's the biggest sized SD card it will support? The rumor that leaked this news said up to 128GB, but that was for the dev kits so who knows. Also the 3DS's reported max SD card size was 32GB but you could install cards larger than that, so even if Nintendo says 128GB is the max size I wouldn't consider that set in stone. I have a 128gb card in my new 3ds, and it works fine. I did have to format outside the 3ds though. I thought I read last night it was 512GB. So my only question is whether gmd is going to buy the Switch so he can play Skyrim on the go, for example, in DC traffic hell. Pre-ordered one so that I could enjoy some of those niche titles and exclusives that only end up on Nintendo consoles like Shin Megami Tensei. Looking forward to some Zelda BOTW. Hope to see a dark gritty new Metroid and a new Earthbound game would be nice. That would be awesome, that series needs more love and I think now is a good time on the Switch and I'm not talking about just VC ports but a new game in the series or maybe even a remake of Mother 2.